Appendix C: Myth or Fact? The Foundations Guide is part of an open professional learning series developed for staff across post-secondary institutions in British Columbia. Guides in the series include: Foundations; Leaders and Administrators; Curriculum Developers; Teachers and Instructors; Front-line Staff, Student Services, and Advisors; and Researchers.. These guides are the result of the Indigenization Project, a collaboration between BCcampus and the Ministry of Advanced Education, Skills and Training. The project was supported by a steering committee of Indigenous education leaders from BC universities, colleges, and institutes, the First Nations Education Steering Committee, the Indigenous Adult and Higher Learning Association, and Métis Nation BC. These guides are intended to support the systemic change occurring across post-secondary institutions through Indigenization, decolonization, and reconciliation. A guiding principle from the Truth and Reconciliation Commission of Canada process states why this change is happening. We all have a role to play. As noted by Universities Canada, “[h]igher education offers great potential for reconciliation and a renewed relationship between Indigenous and non-Indigenous people in Canada.” (2015) Similarly, Colleges and Institutions Canada notes that “Indigenous education will strengthen colleges’ and institutes’ contribution to improving the lives of learners and communities.” (2015) These guides provide a way for all faculty and staff to Indigenize their practice in post-secondary education. 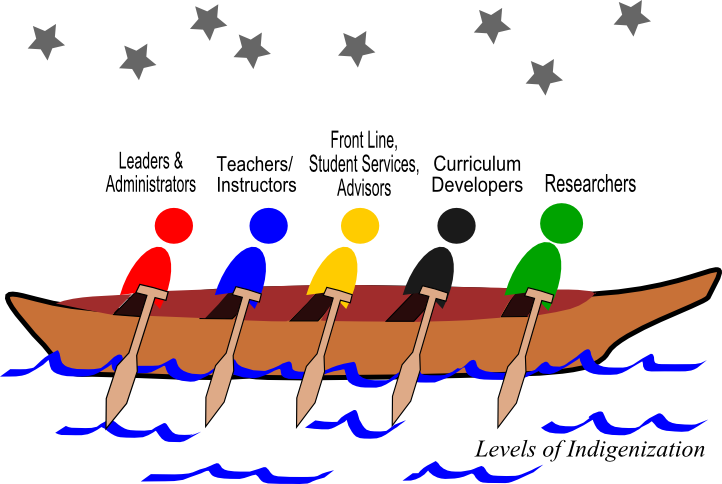 The Indigenization Project can be described as an evolving story of how diverse people can journey forward in a canoe (Fig 0.1). In Indigenous methodology, stories emphasize our relationships with our environment, our communities, and with each other. To stay on course, we are guided by the stars in the sky, with each star a project principle: deliver holistically, learn from one another, work together, share strengths, value collaboration, deepen the learning, engage respectfully, and learn to work in discomfort. As we look ahead, we do not forget our past. The canoe holds Indigenous Peoples and the key people in post-secondary education whose roles support, lead, and build Indigenization. Our combined strengths give us balance and the ability to steer and paddle in unison as we sit side by side. The paddles are the open resources. As we learn to pull together, we understand that our shared knowledge makes us stronger and makes us one. The perpetual motion and depth of water reflects the evolving process of Indigenization. Indigenization is relational and collaborative and involves various levels of transformation, from inclusion and integration to infusion of Indigenous perspectives and approaches in education. As we learn together, we ask new questions, so we continue our journey with curiosity and optimism, always looking for new stories to share. We hope these guides support you in your learning journey. As open education resources they can be adapted to fit local context, in collaboration with Indigenous Peoples who connect with and advise your institution. We expect that as more educators use and revise these guides, they will evolve over time. The Foundations Guide explores Indigenous-Canadian relationships from contact to the present. This guide looks at the diversity of Indigenous Peoples and the historical and contemporary realities since contact. This guide can be used as part of a learning community or in a group learning experience, adapting and augmenting it to include Indigenization pathways at your institution for Indigenous students and communities. The Foundations Guide is not a definitive resource, since First Nation, Métis and Inuit perspectives and approaches are diverse across the province. We invite you to augment it with your own stories and examples, and, where possible, include Indigenous voice and perspectives from your area in the materials. Note: For a technical description of how to adapt this guide please see Appendix D.
Fig 0.1″ Pulling Together: A Canoe Journey by Dianne Biin is used under a CC BY 4.0 International Licence. Overview by Kory Wilson is licensed under a Creative Commons Attribution-NonCommercial 4.0 International License, except where otherwise noted.